TIP – Most Case crawlers have transmission pressure gauges – this is a valuable tool for diagnosing faults. If yours is broken, think about getting it replaced. Q: When cold, why does my transmission not engage drive straight away? A: Often this is due to a lack of pressure due to the transmission pump sucking air – cavitating. If any oil leaks are present, while machine is parked – these are usually leaks on the suction side of system & need repair. If all clamps are tight & no leaks are present – the problem could be the charge pump itself. Q: Why won’t my machine engage left & right tracks at the same time? Why is there a hesitation when I change gears/range? A: There is a problem with internal oil leakage on the slower side. Often oil control rings on shafts are at fault. Sometimes faulty seal rings at clutch pack piston seals. Q: Why does one track want to drive even when in neutral? A : There is a broken plate in a clutch pack, locking it up & causing it to permanently drive. Q: My machine has lost all drive & hydraulics! A : Flexplate likely is broken – check inside engine bellhousing for debris. Q: What do I look for when buying a used dozer / loader? Get the machine to operating temperature; at an idle check each individual gear; the transmission pressure & response time should be EXACTLY the same for each selection. This entry was posted in Crawler Loader/Dozer, Troubleshooting Tips and tagged 1150, 1150B, 1150C, 1150d, 1150e, 1150g, 1150h, 1450, 1450b., 1455, 450, 450B, 450C, 455C, 850, 850b, 850d, 850g, 855, 855c, 855d, 855e, ALR, case equipment, cnh, crawler, dozer, earthmoving, fault finding, ji case, loader, machinery, powershift, service tips, transmission repair, troubleshooting. Bookmark the permalink. I have a 1960ish Case 850 straight that I was working when I heard a rumbling mechnical noise under the seat. I immediately backed the unit out of the work area and noticed a loss of power to the right tracks. It still operates but not as before so I have left it parted until I can get an idea of what might be the problem. Any insight would be very helpful. Thanks!! My first thoughts are that a bearing has failed & this could affect gear contact & the drive performance. I would suggest you drain the transmission oil & see if there is any sign of metal contamination in the oil. You should also inspect the transmission suction screen as this will also show any sign of metal failure. If it looks ok in the transmission, drain the RH final drive & see what you find…..
Don’t use the machine till you find the cause of the noise – as this can cause further damage & repair cost. I have a 1985 Case 450c. My transmission is making a loud banging noise. I can feel the vibrations on the main forward reverse shaft when the machine is running. Would bent or broken clutch disks be a culprit? As soon as the machine is pushing a load it will run silent. I have drained the oil and no contamination. machine functions as it should. The same noise is made in forward and reverse gears. The machine sat for a couple years prior to me buying it. It seems to make a milder noise while in neutral and then intensify when engaged. Any help would be appreciated. Nobody locally seems to know anything about these machines. Usually, bent or broken clutch plates will not cause any noises as you have described. When you drained the oil did you look at the suction screen? This will tell you if something is failing in the transmission. Also, did you drain the two final drive oils, it is possible something could be wrong there. It is also possible you have worn out engine mountings, or worn driveshaft universals. My blade drops sometimes.. It runs fine… Then all of sudden it loses pressure and falls down. No leak and tank is full?? I assume you have a dozer? Is this a Case Machine? If the blade is 2 feet off the ground, how long does it take to reach the ground? I have a 455C Case Loader and when operating after 15 to 20 minutes the transmission pressure builds up so high that it blew the filter and the filter housing apart. After fixing it back, I put a inline pressure gage on the filter assembly and then within 10 to 15 minutes it blew the “O” ring out of the filter and the pressure raised over 500psi. Is there anyway you can help and tell me what you think the problem may be? I would first look at the relief valves located under the torque convertor housing. It is possible the one or more of the valves is sticking, causing the high pressure. The plungers/valve pistons should move freely in their bores. Thank you so much for the advise and I will check that out an then let you know what I find. My 1995 Case 850E Dozer’s Hydraulic control stopped working suddenly while I was logging on a steep slope, fluid was low however I filled it to the full mark the control still did nothing. The single lever control feels like it’s connected, is there an in-line control valve that could be disconnected? I don’t have a repair or maintenance manual. Can you confirm your problem is simply hydraulic control (blade lift & angle), or loss of drive as the transmission also uses a single lever. Everything else works properly, the control “T” handle and all connections to the valve unit are connected, however there is no response from any input from the handle. I have backed the machine off the hillside and it is sitting level, there are no leaks or signs of any damage? The hydraulic system is fully mechanical, with no electrical or cut out valves. If all hydraulic movement has stopped working you will need to check if the pump (mounted to the LH side of the engine timing cover) is still turning. There is an small shaft in the adaptor housing which maybe damaged. If you still have some movement in the hydraulics, but no real power, the main relief valve (fitted to the Dozer control valve – input section) maybe at fault. Pressures will need to be checked with a test gauge. No, the charge pump will not affect the drive as you describe. 1) brake neutralizing valve for stickiness. 2) mechanical failure within the transmission – crownwheel & pinion. 3) mechanical failure in the final drive. Drain the oils in transmission & left final drive & look for debris…. My money is on mechanical failure, sorry. my 1150 case dozer torque converter stops ( output shaft to the trans stops or turns very slow) when the machine gets warm. Pressure drops and stays low for a while then comes back up, but the machine doesn’t always move even when the pressure comes back. My first thoughts are is the transmission charge pump ok? This would need to be tested with a flow meter. If that is ok, you would consider the torque converter to be suspect. There are a few things that can cause pressure loss & they are all internal problems requiring converter removal. Hi John, to be honest I can’t recall if there are plugs behind the flywheel, it’s been too long since I have looked in that area on a 504 engine. The parts book only shows 1 plug & that could be for the camshaft. Sorry I’m not more help to you but I’m away atm & don’t have access to any service manuals. Are you sure the fluid entering the engine is transmission oil? Perhaps it is diesel fuel, due to leaking shaft seals at the injector pump. it is probally very evident that computers are not my forte. however i will give it a try. I have a 1150b track loader that is used on farm. It has a401 case diesel which gave up. I offer my thanks in advance for any advice. I have seen many agricultural engines fitted to construction machinery over the years. If they are both 401’s , I would also assume they are the same or similar block. The online part numbers available shows they have different part numbers for the engine block assy, but I would still think the ag engine will bolt into your 1150b. Interestingly, the parts listing shows a 451b to be the engine fitted to an 1150b……. I would go ahead with the change over, but look closely when the engines are side by side. If the leaking oil is clean, the leak is most likely the main seal on the torque converter. These machines have an external charge pump located on the rear of the converter. The transmission operating pressure should not affect the leak as the seal controls the lubricating oil inside the housing. I don’t recall a breather on the torque converter of a 1150d. ha sorry. it is pushing oil out of the transmission breather. what would cause that. There are two breathers on transmission. One on the filler pipe & one under the right armrest which uses a plastic recovery bottle. I have seen the recovery one overflow when the filler pipe one is blocked. If it is leaking out the filler pipe breather, there is excessive oil movement, perhaps caused from a leaking clutch pack. Does the transmission oil have air bubbles/foam in it if you check it shortly after running it? ill check about the foamy oil but did not recall any bubbles. the oil is coming out the breather on the left hand side mounted on the side on the fuel tank not the filler pipe. i seen that recover bottle but there is no hose connected to it. what seal in the torque do you think is leaking. is there kits to buy or find a rebuilt one. There is not normally a breather in the location you are describing. There should be a small rubber hose from the top of the transmission connected to the recovery bottle, perhaps someone has connected another breather to that hose? You need to check that out. You need to clean that breather at the transmission filler pipe. The seal is the main one in the centre of the housing, it’s about 8″ in diameter. Rebuild kits were available from CNH, however they were expensive due to a lot of unnecessary items being in them. I usually buy individual items. The seals are also available from bearing suppliers once you have it out for a sample. Here’s a link to CNH online parts search using your model. I strongly suggest you purchase a service manual if you already don’t have one. EBay is a good source. Also join an online forum like http://www.heavyequipmentforums.com – this one is great for advice from machinery owners & repairers. I am a regular commenter there. ok. ya i just got a service manual. some things are explained well and some stuff is not. not much trouble shooting for trans or converter. hi. i just changed the trans and hyd oil and filters. let it ideal for for 5 to 10 mins and checked the trans oil. there was little bubbles on the dip stick. it may some air in the system cause i have the filter out and had suction pipes off. should i run it longer and drive it around. and check again. what do you think is causing the bubbles. as i said it was pushing oil out the breather befor. It is possible that the air could be from the short amount of time the machine was run. You should run it for longer & see what happens. Bubbles usually are caused by pump cavitation, that means the pump is sucking air somewhere. If the suction hoses are hard, this could be a cause, also if the charge pump is worn. It is also possible to create air bubbles If there is a large internal hemerage in the transmission, this can be isolated by conducting pressure test of the each individual gear range while the transmission is hot. The breather in the transmission oil filler pipe should be periodically removed & washed in some solvent or fuel & blown with compressed air. hi. there is no breather in the filler pipe its a rubber type plug with a t handle on it and dipstick. the filler pipe goes into the lower part of the trans below the oil level at the back of the trans D E are like this. the C and older had the with the breather in filler pipe. do you think a breather or recover bottle is better. I am very familiar with 1150D & E transmissions. There is a porous bronze breather inside a hex alloy retainer which is located at the rear of the filler pipe near the dipstick, look for it, it’s there for sure. 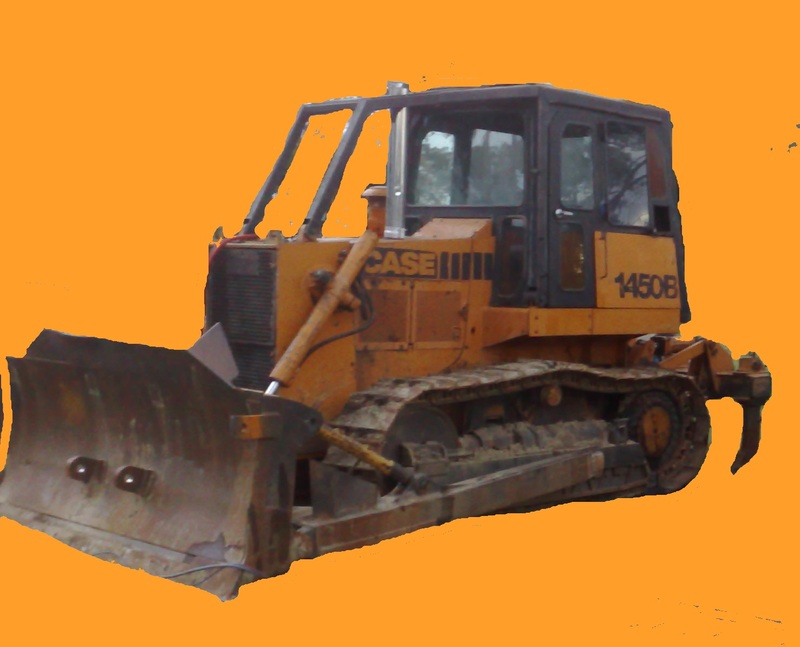 Hello, I have a Case 1150B dozer, serial #7306336 that has a transmission issue. The left side forward and reverse are strong. The right side forward and reverse do not work. When you move the right side lever forward or back wards you can hear a little pressure or something “hit” but the right side doesn’t move. I changed the two canister transmission filters which were dirty and it helped the left move even stronger but the right side still doesn’t move. I’m going to see today if the right side levers move the valve spool but beyond that do you have any ideas or suggestions? Thanks in advance! Did you drain the transmission oil when you cleaned the suction screen? Was any metal present in the screen or drain pan? Is the RHS free wheeling or does it lock up? Drain the final drive oil also & check for debris. The transmission fluid did not hit the dip stick when I got the machine, I just added 5 gallons of HyTrax fluid to the transmission and I did not clean the suction screen. The RHS is free and rolls. I will check the final drive. Does this machine have 2 separate transmissions, one for each side, or just one transmission for both? The final drives are both separate from the main transmission, using hypoid gear oil. If the final drive drains clear, I would next drain the transmission oil & inspect the screen, maybe you will find a clue. Loss of drive in all ranges is not a good thing. It can mean a problem with crownwheel & pinion or final drive. If the oils are clear you need to inspect the RH brake spool at the transmission control valve. It is possible it may have broken a spring causing neutralizing of the track.